The Miami Heat and The Oklahoma City Thunder are two of the most exciting teams in the NBA today. For the Thunder, this is their first trip to the NBA Finals. For the Heat, this is their third. 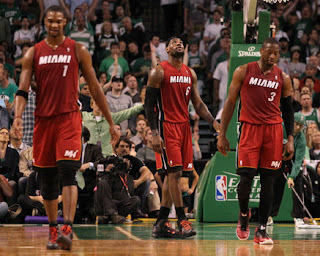 In 2010, Chris Bosh and LeBron James joined Dwyane Wade in Miami, and they declared that they would not win one, instead they would win multiple championships. A year ago, they reached the finals and came within two games of winning it all, but they forgot they had to win two more games before Dallas could win four. The 2010-2011 season ended in disappointment. When the playoffs began, the Heat secured the number two seed. But when Derrick Rose went down with injury, the number one seed Chicago Bulls chances of advancing were slim. As they were ousted in the first round, the pressure rose on the Heat. 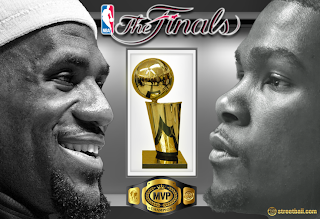 The Heat faced adversity twice in their run back to the finals. They faced a 2-1 and 3-2 deficit against the Pacers and Celtics. After coming back in both series, LeBron James finds himself in his 3rd career NBA Finals, and preparing for the Thunder, a team that they split the season series with. 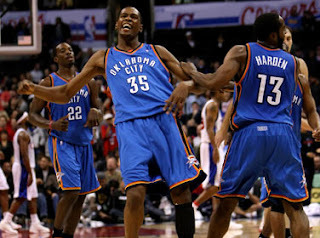 The Oklahoma City Thunder came into this years playoffs with a bad taste in their mouth. After being swept by the Dallas Mavericks a year ago in the Western Conference Finals, they would return the favor this year sweeping the defending champions. In the second round, they faced a team that defeated them two years ago when they made their first appearance in the playoffs, the Los Angeles Lakers. As the Thunder steamrolled through the playoffs, only losing one game, they met a road block in San Antonio. The Spurs, a team that had yet to lose seemed as if they were going to stop the young studs in OKC. But when they returned to their home court, they were able to make the necessary adjustments and not lose again. Now these young studs are faced with the challenge of the bright lights and the world watching as they reach the first finals in franchise history.